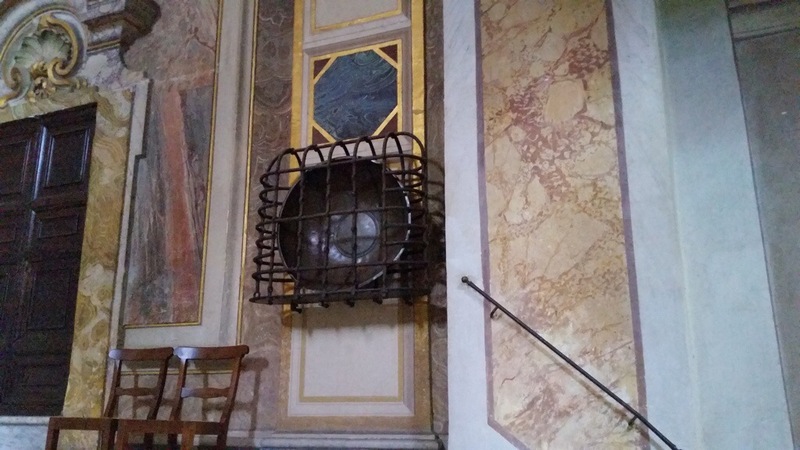 When I was in high school at St. Stephen’s School in Rome, we had an annual “treasure hunt” in which groups of students would be sent to all corners of the city, led by obscure clues. 21 years later, on the occasion of the school’s 50th anniversary, I found myself setting off on a treasure hunt mission once again. 1. Find the nostalgic antique shop at Via di Ripetta, 49. What seems to be its specialty? Photograph the display windows. You could price an interesting object or even buy one. One wonders what the shopkeeper thinks of the new Ara Pacis “container” by Richard Meier. 2. Go to Piazza Santi Apostoli. Admire the palace facing the church. Which family owned it? Note their “stemma” (family crest). 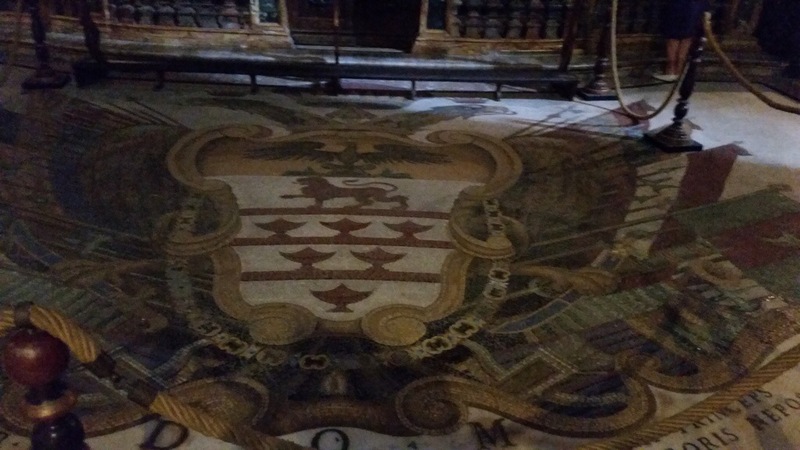 Then enter the church and find a spectacular floor mosaic witht this same stemma, with additions showing where this nobleman fought for and against whom. Birds, sheep and banners. Then quietly enter the crypt. 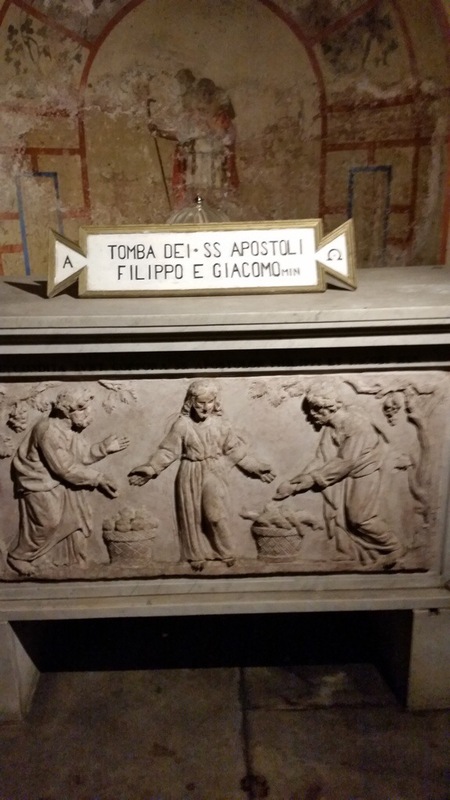 Who are the two apostles and who is buried in the chapel to the left (father of Pope Julius II) and at the opposite end is a fake catacomb grave. She is a girl with wo fish called __________. What room with frescoes has recently been opened to the public? 3. Go to the Ufficio della Provincia opposite the Piazza Santi Apostoli. What can one do below the building? If you are so inclined, you might want to do it. 4. You have seen the tombs of the two apostles. There is another, besides Peter, who is buried in Rome. 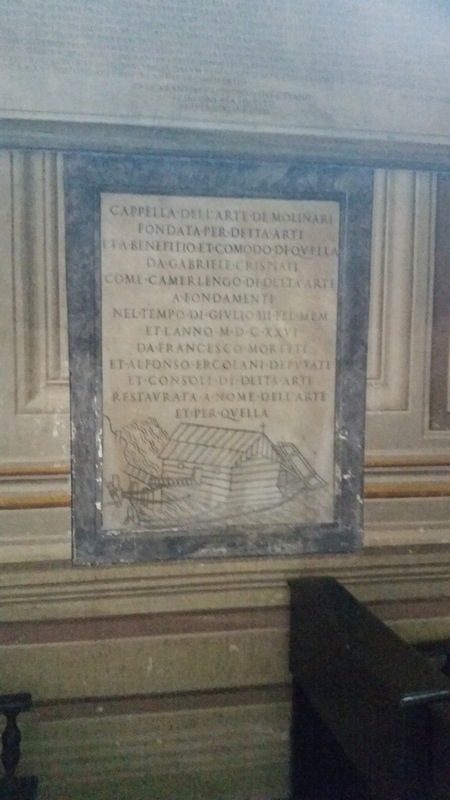 Go to the Tiber Island and find wehre the apostle is buried. What is his name? 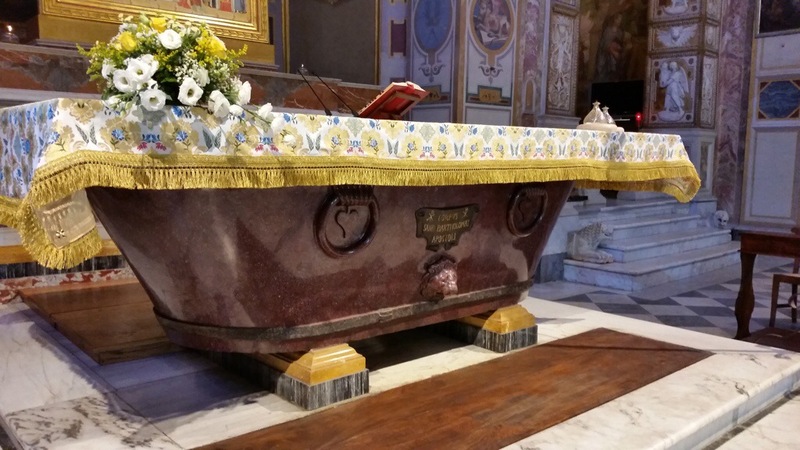 How did his remains get to Rome? What ancient guild also has a space in the same building where the apostle is buried? 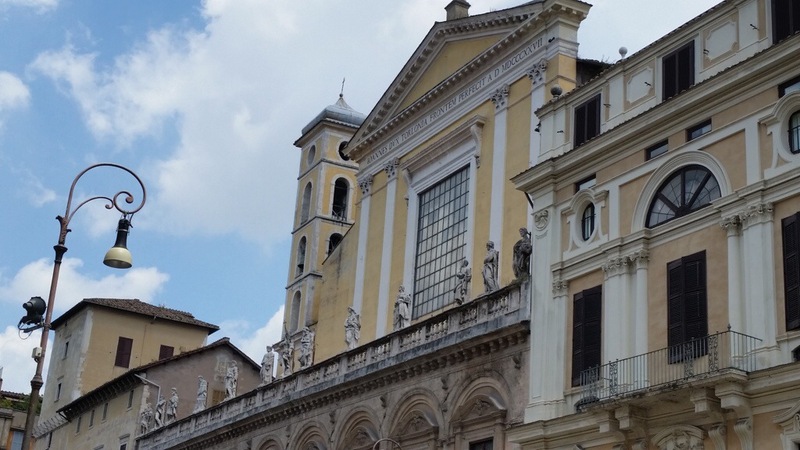 When we arrived on the Tiber Island (where I once had to go for a tetanus shot after stepping on a rusty tack), we found a wedding party pouring out of the Basilica of St. Bartholomew on the Tiber Island. Could this be where our apostle was? Exactly who brought them there and why was less clear. Rifling through one of the books for sale in the church, I found two possible stories. One was that King Otto II brought them with the intention of later transporting them to Germany, and another suggested that King Otto III had built the church there in order to honor St. Bartholomew and a martyr by the name of Adalbert. 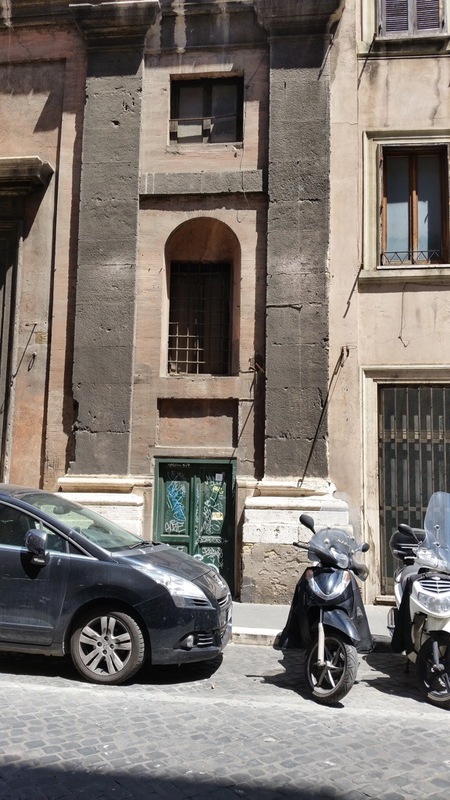 As for the ancient guild, it is only fitting that at a time when grain mills were often water powered, the guild of millers would have a space in a basilica on the Tiber Island. We were feeling quite pleased with ourselves as we left the church, our sights set on clue #2. 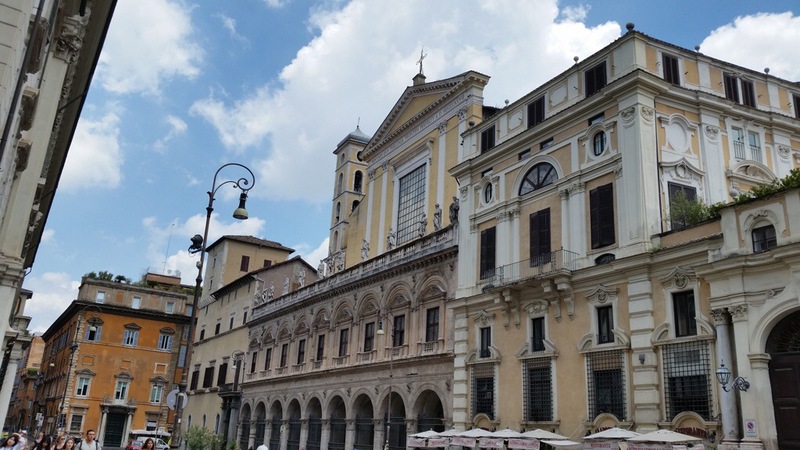 It wasn’t a very long walk to Piazza Santi Apostoli, and it was easy to tell we’d found our mark when we were greeted by a line of saints looking stately stop their perches. We hadn’t kept a very vigilant eye on the time, however, and ended up staring hard at the front door to the church through heavy and resolutely locked gates. Still, the palazzo across the way was still there to be admired. Though there was still the matter of the family’s name. 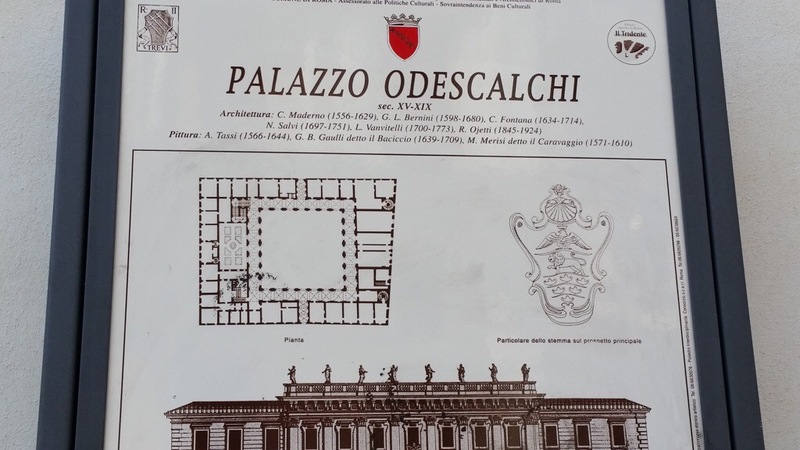 The massive doors of the palazzo were open, so Lizzie and I wandered over to see what we could discover. I was just getting ready to propel Kaya forward into the cortile of the palazzo so that I might follow him in when a spectral figure stepped out to greet us. Lizzie asked her politely whether we might enter, but we were informed firmly that the interior was private and for us to go in was quite out of the question. Lizzie pressed her for the name of the family and she said xxxx…schacchi. Confused, we tried several times to repeat what she’d said to her satisfaction, but she tired of us, bared her teeth, and walked in to the private interior of the palazzo. “I don’t think that she told us the actual name of the family,” said Lizzie as we crossed the piazza to share what we’d discovered. This all called for a coffee break. We cooled our heels for a while in a nearby bar, over coffee and sandwiches, while plotting our next move. 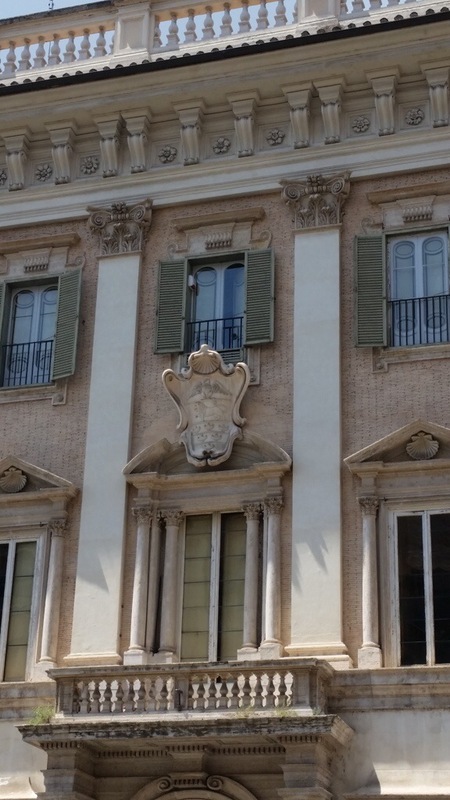 We had spotted the Ufficio della Provincia before our break. We wondered what it might be possible to do below the building. “I bet you can get married,” guessed Matt, and no one could top that. Well the answer turned out to be quite different. 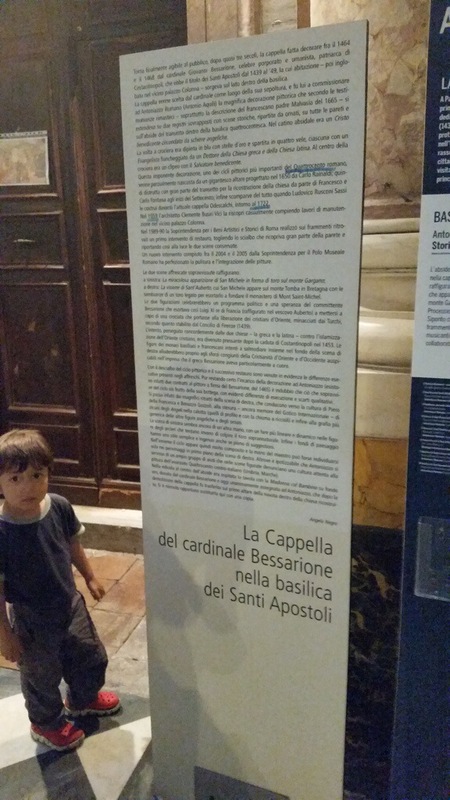 About 6 weeks before our trip, a Leslie had written us about a museum that hadn’t been there when we were in Rome. It was apparently some sort of reconstruction of a Roman home that you could join tours to see. The only upshot was that you had to book in advance, and this we failed to do. 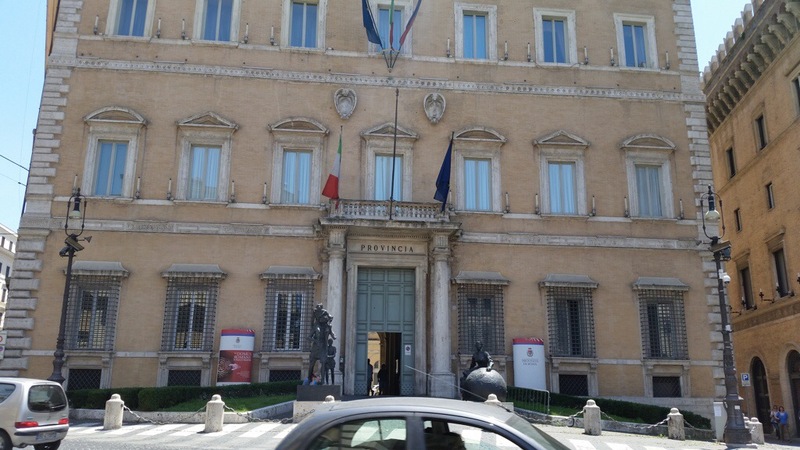 Imagine our surprise to find ourselves brought to the door of that very museum, which is housed beneath the Ufficio della Provincia, by the hand of the treasure hunt. Matt and Leslie went in to see if we might not be able to secure last minute tickets and emerged with a reservation for the 3 o’clock tour. It was 1:30. On to clue 1. 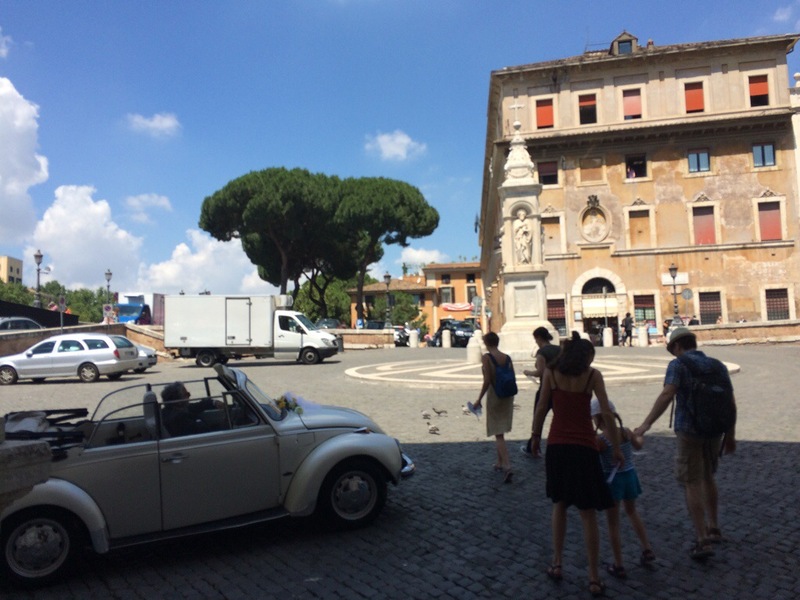 Evelyn fell asleep as we walked towards Piazza di Spagna, so Matt sat in the shade with her while we walked on in search of Via di Ripetta. 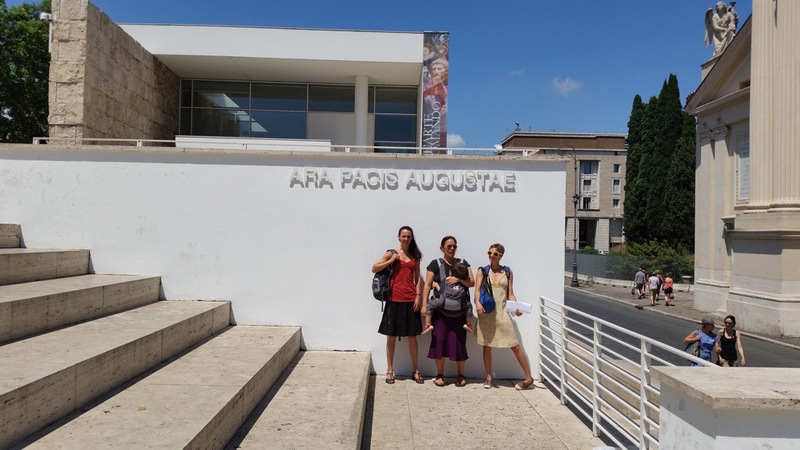 It announced itself with the presence of the Ara Pacis museum. but it was hard to tell because the numbers jumped from 44 to 60 to either side of it. Thankful that we hadn’t dragged a sleeping child on a wild goose chase, we headed back to regroup and catch our tour. The museum was very interesting. The highlight for me was a narration of all of the events depicted on Trajan’s column which the Roman houses we visited would have looked out upon. 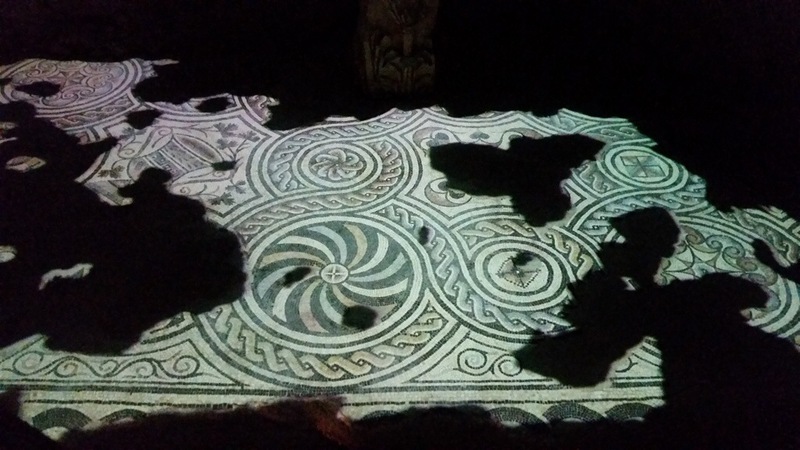 During the section of the tour in the ancient homes, they used lots of light effects to illustrate how the houses might have looked, including one particularly striking one where they used light to complete a mosaic floor. And although they were a tiny bit heavy handed with the “going back in time” narrative and the tour proved slightly too long winded for the children, we had a good time. Back outside in the blazing sun, we decided to take another crack at the church. but failed to interpret it. but lacked the energy to chase down the rest of the bedfellows. that we were unable to enter. It was after 5 and we were at the ends of our ropes. So we parted ways, not exactly victorious but certainly feeling that we’d had a few adventures and uncovered a gem or two. And it brought back to me how much I’d always enjoyed St. Stephen’s treasure hunts. There’s the puzzle of it all and the putting our heads together, but most of all I think it’s something that shows you how rich the obscure at destinations in the city can be and it reminds us to unearth these hidden gems wherever we may find ourselves. 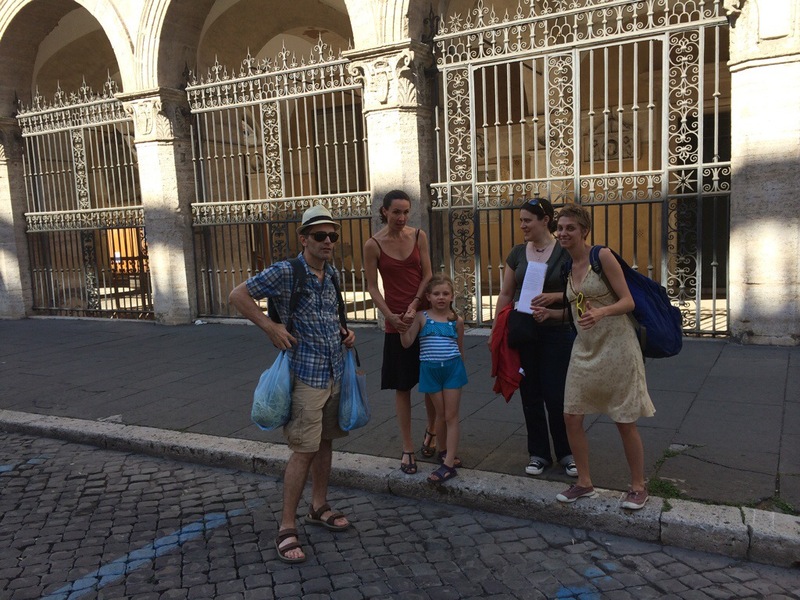 What an amazing adventure – it’s been way too long since I was in Roma! I loved reading about this! I have never been to Rome and have always wanted to go. Thank you for sharing! Oh I hope you will! The thing that blew me away in his trip was the cheese. Eating fresh squishy mozzarella and burrata made me want to keep a buffalo.